Attics - MGT Insulation, Inc. 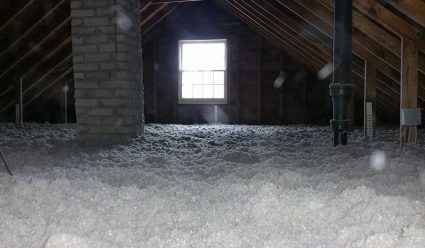 The three keys to a high-performance attic are attic insulation, attic ventilation , and air sealing , and at MGT Insulation, we do all three. When insulating attics, we begin by sealing all gaps, openings, cracks, and holes between the attic and the heated area below. We ensure proper ventilation with vents and air chutes, and we finish by using high quality insulation to increase the effectiveness of your home or business’s heating systems, keeping you and your family more comfortable during the frigid winter months. Before insulating an attic, it must be sealed, which means closing all accessible gaps, openings, cracks, holes between the attic and the heated area below. MGT Insulation offers expert air and attic sealing services to start your insulation project off right. Learn more here. It’s important to ventilate your attic in order to prevent moisture issues, such as mold growth and ice dams. It also protects your roof shingles from overheating and premature aging. Learn more about our quality attic ventilation systems here. Before 1979, there were no codes or standards for building insulation, including attics. Now, attic insulation R-values are R-50 or more in Minnesota, for both existing and new construction. This equals about 14″ of cellulose or 18″ of fiberglass. At MGT Insulation, we offer free insulation evaluations and thermal imaging to determine what your attic needs. We specialize in attic insulation removal and replacement that will increase your energy efficiency, comfort, and indoor air quality. Contact us today to learn more! Our comprehensive attic insulation process ensures that your attic will function efficiently to keep your home or business comfortable, safe, and cost-effective. The steps differ depending on the structure of your home or business, and we address all structures with the same level of care and craftsmanship. Our highly trained technicians use state-of-the-art equipment to identify areas of energy savings for you. An infrared camera, especially done in conjunction with a blower door test, can identify uninsulated and poorly insulated attic areas. Our diagnostic testing also quickly pinpoints unsealed attic bypasses. Exhaust fans are properly vented to the outside. If desired, a storage area is designated and protected from insulation. If necessary, chutes are installed for attic ventilation. A sturdy, wooden dam is installed to keep insulation in place and to protect attic access. Markers identifying the number of inches of insulation and certificates indicating the type of insulation and number of bags installed per UBC are placed for visual confirmation. Your attic and/or peak is insulated to a predetermined R-value using one of our high-quality insulation products. Your hatch or access doors receive THERMAX™ brand foam board or fiberglass insulation, weather-stripping, and possibly house wrap, door sweeps, and barrel bolts as needed to continue your thermal envelope. Roof vents may be added for ventilation or crew access as needed. They are available in black, brown, or grey. We perform another blower door test to determine your home or business’s increase in comfort due to air and bypass sealing. Our crews now how to broom clean and vacuum! At MGT Insulation, we are committed to using the highest quality products on every job we do. Learn more here.